An All-in-One Site for Ergononomic Info! Want new info on making your office at home or work more ergonomics? Check out Ergonomics Info here. 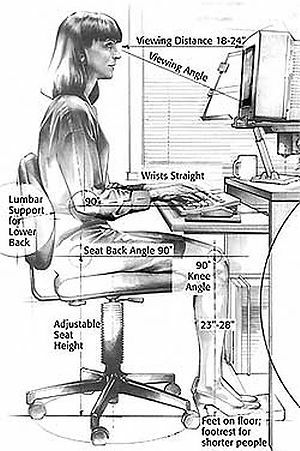 The site provides tips on ergonomic consideration for desktop computer users, laptop computer users and ideal monitor, chair and desk position to help those that work more than 2 hours a day on computers. For computer ergonomic tips, click here. The site also includes chair reviews, keyboard and mouse reviews. The site also has a great graphic that shows proper seating positioning at a computer workstation. Go to this link and then scroll to the bottom of the page to see the graphic!